Oh yes - I loves to pawty cuz itza fur shure way to enjoy fantasticat furiends and furmily. Catzowey! Nothing makes my smitten kitten whiskers wiggle or my tongue tingle, like good foods on platters where we can have abundacat chatters and catch up. Holy rigatoni, this izza no Bologna baloney! Befur ya gets to da pawty platters itza very impurrtant you wake up frum yur catnap and sturrrretch, yep uh huh sturrrretch. Cuz you wants all yur pawty muscles moving in da correcticat direction. Then like lickety splickety, you gets purrky and in the pawty mood. NOWza MEOWza, weeza at da Pawty with furiends and furmily, and pawsatively weeza pawsitioned us at da wine bar cuz itza great place to meet n' greet or mingle and jingle. Snif-snifaloni! I thinks I smells some molto meowster furmaggi and grapes... ahhhh datsa mewsic to my cat ears! You can catch up and cat chat over da giganticat platters loaded with furesh Impurrted herb cheeses (purrobably a little NIP sprinkled on it too!) and CalEyeFurKneeYah organicat fruits. Wait a meowment .. is that a pawty platter of cat cwackers? Youza can have da whole feline family of cwackers if yur pawty platter is family size. When I'm finito catching up and cat chatting over the platters of appurrtizers, then I purrfurrs to cook a molto bene Risotto - yep uh huh like da fabucatulous EyeTailYun nicey ricey dish. And I tells ya, yep uh huh, da best Risotto is da Beretta, cuz there's no betta! And good mews: when da box is empty, youza can lean against da box and become a relaxacat, so this izza really recycling. Always purrvide yur guests a place to be relaxacatted cuz catching up and doing so much chatter over the platter can make you a tad tired right in the middle of the pawty. When youza rested then you can return to da pawty fur more chatter over the platter! Be shure YOU have a nonCATastrophic week! Itza cold week in January - but we gots a storm of warm awards entertaining youza and mio, so fur shure, I took all 4 of my paws to the glitteratzi Golden Globes. 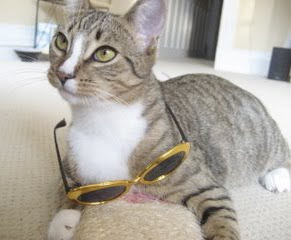 Good thing my extraordinaire assistacat suggested I pack my Hollywood shades fur my zippity do dah trip to La La Land, cuz theyza got flash bulbs popping everywhere in Hollywood! 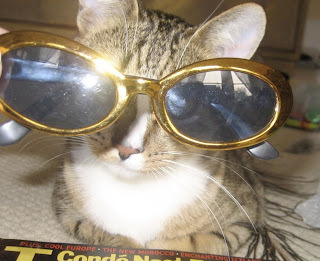 And if youza not wearing da shades then youza goes blinkety blink blink all da time and then youza gets a nonPURRfurential photo! Itza prahpurr purractice in Hollywood that guys attending Golden Globes Award Ceremeowny always wears da Black Tie - so my purrsonal EyeTailYun deeziner from Meowlano Italia, had me looking at various purrcarious black and white fabrics. Itza confewsing but amewsing when the Foreign Purress nominates da mewvees (I catnapped thru a few) then da mewvee stars wearing clothes theyza borrowed (basta pasta they don't own their clothes!) gets on stage to do purresentashuns. Theyza looks directicatically into da camera so theyza really looking smackity dabbity at youza at home so youza paying attenZeeOhKnee! This year there's abundacat confusing nominashuns : "Itza Complicated" but hey, life isn't complicated if youza meowster cuz life is CATZOWEY purrfecto! And "Julie and Julia"? Catzowey what state of the art nip is da Purrducer smoking dat he doesn't know exacticatically what's da name of his mewvie! And "Avatar" - wellza you tellza me if it spells something impurrtant backwards! Itza no new news that "Nine" izza my favorito pick cuz you knows 9 lives is what life's all about in my meowster mind and shhhh dontcha tell but da star in dis mewvee is named GUIDO!! Once da Golden Globe ceremeownies wazza over (Shuksatini! I pawsographed so much I ran out of da inky dinky ink in my paw pen) I removed my Purrparazzi La La Land shades and kicked back to have a meowvalous fantasticat moment .... a PurrEyeVat moment with me and myself on the glitzy golden carpet. At the end of the evening, I was ready fur my litter box - yep uh huh, some things never get Hollywood'ized! Nope, itza not meowmory loss and you've not catnapped thru da 2010 and fur shure, itza not Halloween already. I'ma justa fureeezing so I put on my other coat to stay warm in the storm. Even my furiends in the Tropicatical places izza seeing white stuff fall frum the skies - datsa someting to see when youza lounging under da palm tree on da white sandy litter box beach or sipping a Meowtini on a Catamaran. So... purrhaps you and yurself izza both stuck in da house and purrpondering howza to warm up yur paws, and if that soundza like you, me and myself izza gonna SirPrize you with how exacticatically to get warm in the storm. Furst ya wanna fur shure yep uh huh itza true, get yur smitten kitten mittens out frum yur pockets so youza can grab on and be bizzi. Itza purroven datza staying bizzi in the house izza one way to get warm in the storm. Purrhaps youza can rearrange things in yur shower or rub a dub dub tub. Uncurling while unfurling the shower curtain can be da supuurbo warming exercise when youza feeling chilly. NOWza MEOWza - I'ma not saying to be cataclysmic and shred da curtain - justa fix it nice. CATZOWEY! Never be bizzi wtihout wearing yur watch so youza exacticatically knows when itza time to stop being bizzi and time to catnap! Categorically cat chatting, if youza wantza purrk up and still stay bizzi so youza staying warm in da storm, youza can get all da luggage out of da closets and start removing da old n' dusty destinashun tags. Hey youza already wentza on da trip soza how come youza got so many dusty destinashun tags collecting in da collekshun? Nowza Meowza itza not Momma Teresa itza me wrapped up in my EyeTailYun blanket! Youza purrobably exhausticatted frum being bizzi so best to get under yur favorito blankie and hunker down fur a warm catnap or try to CATch yurself 40 winkies worth. Whatever ya duz, youza stay safe in da storm and fur shure stay warm! Wishing you a nonCATastrophic week with abundacat sunrays. Catzowey! Me and things are both looking UP UP UP instead of down and around like we did in da old year, and itza just a few amewsing days into 2010 - but I gots da question fur youza and yurza self: how youza gonna purrnounce this year? Some extraordinairacat expurrt sez weeza to call it "Twenty Ten" and da other expurrt (purrobably from da Wall Street Departameownto of Expurrteeze) sez to call it "OH Ten. Well Oh Kay, but Basta Pasta andza Holy Cannoli! Can't anybody agree on what weeza calling this Mew Year? Me and my smitten kitten self has been looking UP UP UP since midnight of da MEW Years Eve so now I'ma taking a break - gonna look down down down and see old and new dust, food on da floor and interesting stuff. Itza recommended to look down when you'za cleaning out da old flower petals or catnip leaves frumza last year (and purrhaps wear da Snorkel too) ... yep uh huh cuz da nip leaves and petals falls everywhere ya don'tza wanna them to fall. But you can bet theyza falls down down close to da ground. If youza looking down and not paying da attenshun, youza gonna have a SirPrize fur shure! Like purrhaps youza gonna get stuck! That is definicatically true and authenticatically proven. AhTenZeeOhKnee! Yep uh huh - I needza yur AhTenZeeOhKnee (datsa EyeTailYun ya know!) cuz I wantz you to know that weeza just a few meowvaloso days into this MEW Year that izza looking UP UP UP. Itza impurrtant to be shure dat you don't let the whole giganticat year pass you by cuz befur ya knows it, itza gonna be da other Mew Year 2011 (nowza howza we supposed to purrnounce dat? No worry, cuz youza got 1 giganticat year to purractice). Notice my meowster self in da foto taken by da Purrparazzi while I'ma climbing da CATacombs in Rome back in da year "OH Six"! Befur you knows it, youza grows it, oopsatini, I mean youza grows up or in some cases, youza grows out and gets a bit bigger. So youza sees da time flies by feline fast even when ya gotza 9 lives! I recommends ya dontza let this 2010 pass ya by - itza gonna be a meowvalous year so look UP UP UP. Wishing you a meowvalous FURst week of the Mew Year! And hey, why not make it a nonCATastrophic one too!